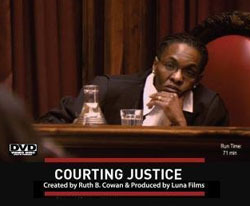 Courting Justice features seven South African women judges, all of whom were New Democracy appointments. They serve on the Constitutional Court, the Supreme Court of Appeal and the provincial High Courts. They speak to us while at work in their court rooms and chambers, at home and in the communities in which they were raised. Courting Justice is their story. It is a very personal story, revealing the challenges they confront working in a previously all-male institution and the sacrifices they make to effect the Constitution’s human rights promises. Their stories, like all good stories, are also about something else. The “something else” in Courting Justice is South Africa’s transition from a racist, sexist, exploitative, brutal and oppressive past to a human rights-based constitutional democracy, and about the judiciary’s engagement in effecting that transition. Lynn Hecht Schafran, National Judicial Education Program,Legal Momentum Captures in their own words several of the first women, particularly Black women, to become judges in South Africa, presenting them as individuals and placing them in the extraordinary history of their country. We hear their pride in women judges' achievements despite the sacrifices entailed, their commitment to bring the perspectives of women from vastly different life experiences into the justice system, and the deep responsibility these judges feel for creating a human rights jurisprudence for South Africa's new democracy. A rich and moving film for a wide variety of audiences. Anne T. Goldstein, Human Rights Education Director, International Association of Women JudgesI have been working with women judges for fifteen years, and have met three of the judges in the film last night. It was wonderful watching how well the judges pulled together so many of the themes that women judges all over the world explore and struggle with. I loved the way that music pulled together disparate scenes, and enjoyed the whole thing thoroughly. Jane A. Morse, Office of International Information Programs, U.S. Department of State Two years after its initial release…Courting Justice continues to inspire audiences around the world with its story of South African women who fought against all odds to win judgeships in the country’s highest courts. Neasa Ní Chianáin, Festival Co-Director, Guth Gafa Documentary Festival, Meenderry, Falcarragh, Co. Donegal, Ireland I was really moved, it lights a fire in your belly! The drive that led to creating Courting Justice came from my work in developing countries, continents away from South Africa. My work in those countries—work which was directed at poverty alleviation, strengthened my belief that democratic governments are essential—not sufficient, but essential—to meeting such major societal needs as poverty reduction, economic development, public health improvement, educational advancement and human rights. I gave myself the gift of time to study what was being done theoretically and practically to establish democracies.